Marvel’s main takeaway from the success of Captain America: Civil War seems to be that people like it when a lot of charming celebrities come together in one movie. Now the studio is doubling down on that philosophy by cramming as many famous faces as possible into Thor: Ragnarok. The third Thor film is set to be something of a galactic buddy road trip movie starring Thor (Chris Hemsworth), Loki (Tom Hiddleston), and the Hulk (Mark Ruffalo). And while we previously knew they’d be meeting baddie Cate Blanchett and new love interest Tessa Thompson along the way, Marvel apparently reached into the celebrity grab bag to fill out the rest of the cast. Marvel also released information on who all these new cast members will be playing. Blanchett is the “mysterious and powerful” villain Hela. Thompson is the heroic Asgardian warrior Valkyrie. Goldblum will be the “eccentric” Grandmaster, who has a comic-book connection to The Collector, Benicio del Toro’s Liberace-esque character from Guardians Of The Galaxy. And Urban is playing the terribly named villain Skurge. (Nerdist has a more detailed breakdown of each character’s comic book origins.) Plus Marvel officially released this concept art, which may or may not confirm that Thor: Ragnarok is about the hunt for the Yellow King. Of course Thor: Ragnarok doesn’t hit theaters until November 2017, so until then we’re left to point out just how incestuous these big Hollywood franchises have become. For instance, Urban is actually the fifth Star Trek/MCU crossover, joining Zoe Saldana, Benedict Cumberbatch, Idris Elba, and Hemsworth himself, who have all pulled double duty. (Chris Pine, meanwhile, has thrown his lot in with DC and John Cho is currently only playing superheroes in our dreams.) 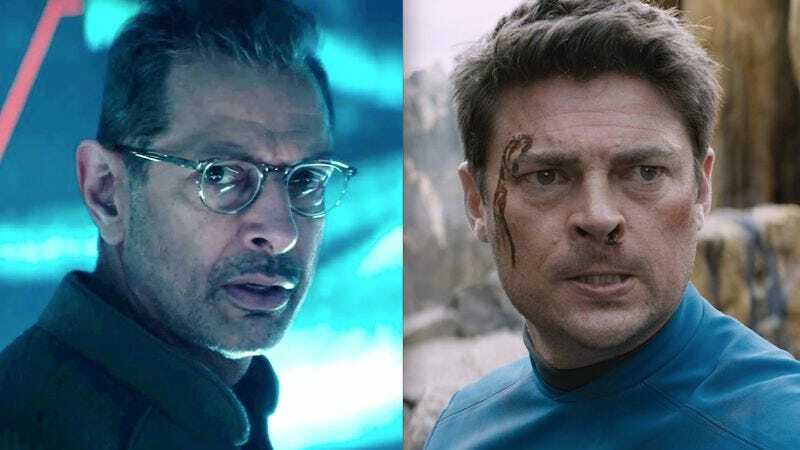 And Goldblum will have the rare honor of working with two Hemsworth brothers, since he already shot Independence Day: Resurgence alongside Liam Hemsworth. It’s veritable never-ending array of connections (Blanchett was also in Lord Of The Rings with Urban), but at least there’s one less factor to consider: Natalie Portman is officially out of the film.